“Our thoughts and prayers go out to the millions of people affected by this devastating storm,” Obama said in a statement. The U.S. government aid – both military and civilian – began flowing as relief efforts got under way by international organizations and private relief groups. The U.S. Agency for International Development is sending supplies, including emergency shelter and hygiene materials, to help 10,000 families. The supplies are expected to arrive early this week, according to a spokeswoman. USAID also is dispatching 55 metric tons of emergency food to feed 20,000 children and 15,000 adults for up to five days, the agency said. 90 U.S. Marines and sailors arrived in the Philippines as part of a first wave of promised U.S. military assistance, which included aircraft for search and rescue operations. EU: EU: European Union Ambassador Guy Ledoux to the Philippines also expressed yesterday his solidarity with the Filipinos and announced humanitarian teams and relief packages were on their way to affected areas. “The Philippines has been severely tested by nature on several occasions this year. As it confronts yet another natural calamity, I express my solidarity with the Filipino people and my deep sympathy with those who have lost their loved ones or their livelihoods,” Ledoux said in a statement. The European Union Humanitarian Aid & Civil Protection said it is deploying four experts to areas near Cebu and Leyte and will also help assess the plight of the victims of the recent earthquake on the island of Bohol. Australia: Foreign Minister Julie Bishop says the Australian Government will contribute $10 million in aid, which will include $390,500 of emergency supplies previously announced by Ms Bishop on Saturday. “I have approved a $10 million package of humanitarian assistance. This comprises the urgent deployment of an Australian medical assistance team – at a cost of about $1 million, $3 million to be deployed through Australian non-government organisations, $4 million to the United Nations flash appeal,” she said. “Canada is deeply concerned by the impact of this catastrophic typhoon,” said Canadian Minister of International Development and Minister for La Francophonie Christian Paradis said in a statement. New Zealand: New Zealand will give another $2 million to support humanitarian relief efforts in the Philippines following Typhoon Haiyan, Foreign Affairs Minister Murray McCully announced this afternoon. The money is in addition to the $150,000 already pledged. “Typhoon Haiyan has caused significant damage and affected more than 4.4 million people across 36 provinces in the Philippines,” Mr McCully said. The $150,000 that New Zealand had already committed would go to the International Federation for Red Cross to support the immediate distribution of relief supplies and conduct needs assessment. In addition, an official from the New Zealand Aid Programme would be joining the specialist United Nations Disaster Assessment Co-ordination team. UK: David Cameron has offered £6m in emergency aid to the president of the Philippines to help dealing with the aftermath of Typhoon Haiyan. The Prime Minister called President Benigno Aquino III to pledge the UK’s full support following the deadly storm and to offer the country’s thoughts to the victims. The Prime Minister said that our thoughts are with all those affected, especially those who have lost loved ones,” a Downing Street spokeswoman said. Belgium: Médecins Sans Frontières (Doctors Without Borders) said it was sending 200 tons of aid—medicine, tents, hygiene kits—to arrive mid-week, with a first cargo plane leaving from Dubai on Monday and another from Belgium on Tuesday. Israel: IsraAID will send a team this week to assist local NGOs and UN agencies in treating hundreds of thousands of people affected by a powerful typhoon that hit the Philippines Friday. UAE: The UAE has announced support and assistance programmes and projects worth Dh37 million for Philippine typhoon victims on the directive of the President, Sheikh Khalifa. “The UAE extends its deepest sympathies for the loss of life and property,” the Government said. “The UAE stands by the people of the Philippines in these tragic circumstances and commends the Government of the Philippines and its emergency workers for making all possible efforts in providing aid and relief to the victims. Nicolas Hefner, spokesperson for the German Federal Agency for Technical Relief (THW) told DW his agency would be sending a team to Manila to determine where and how the German government can help. The THW provides assistance in areas such as purifying drinking water, cleaning contaminated wells and providing emergency accommodation. UN: UN leader Ban Ki-moon promised UN humanitarian agencies would “respond rapidly to help people in need”. The UN children’s fund UNICEF said a cargo plane carrying 60 tonnes of aid including shelters and medicine would arrive in the Philippines Tuesday, to be followed by deliveries of water purification and sanitation equipment. Vatican: Pope Francis, “deeply saddened” by the disaster, on Sunday urged Catholics to provide “concrete help” and led 60,000 people in prayers for the Philippines. “Sadly, there are many, many victims and the damage is huge,” he said. On Saturday, he had tweeted his sympathy to the Asian nation. Norway: Norway commits to a contribution of NOK 20 million (PHP 140 million) in immediate humanitarian assistance to the Philippines. The NOK 20 million will be channeled through the UN, the Red Cross and other humanitarian organizations which have access to the affected areas. “I want to express sympathy with the Filipino people who have been hit so hard by this disaster. We follow the humanitarian situation in the Philippines closely and will provide further assistance when we get a better overview of the needs,” said Minister of Foreign Affairs Børge Brende in a statement posted on the Norwegian Embassy website. Japan: Japan, meanwhile, said it is sending a 25-member team, mostly medical personnel, to help following the devastation of typhoon Yolanda. Singapore: Singaporeans and Filipinos here are rallying to help victims of Super Typhoon Haiyan. The Singapore Civil Defence Force has sent a team to Tacloban, the worst-hit city, to aid rescue efforts by the United Nations Office for the Coordination of Humanitarian Affairs, said Prime Minister Lee Hsien Loong yesterday. In a letter to Philippine President Benigno Aquino, Mr Lee offered his condolences and help. “The Philippines has always demonstrated resilience in the face of adversity. I am confident that your people will pull together and rebuild their lives… Our thoughts are with the people of the Philippines during this difficult time,” he wrote. Switzerland: Switzerland has sent five experts from the Swiss Humanitarian Aid Unit to the Philippines after a devastating typhoon reportedly killed at least 10,000 people. The Swiss foreign ministry said the group left on Saturday evening and would work closely with international aid organisations, delivering emergency assistance. The foreign ministry said three Swiss experts, including doctors, were already in the Philippines. They are liaising closely with the Swiss embassy in Manila and assessing the needs of the people on the ground. Hungary: A team carrying medical equipment and 15,000 dollars in aid from the Hungarian Reformed Charity will leave for the typhoon-hit Philippines on Monday, the charity told MTI on Sunday. Denmark: Danmark giver 10 millioner i tyfon-hjælp til Filippinerne. – Det er en meget markant naturkatastrofe, hvor hundredetusinder af mennesker nu er i sorg og i nød, og derfor har vi besluttet at give op til 10 millioner kroner i nødhjælp, siger udviklingsminister Christian Friis Bach (R) til DR Nyheder. Hjælpen kan blandt andet bestå af mad, vand og telte. – Pengene vil være til rådighed så snart der ligger en appel fra FN. FN og de filippinske myndigheder er i fuld gang med at få overblik over katastrofen og vurdere behovene. Så udsender de en appel, og der vil vi med det samme byde ind, siger ministeren. Ireland: The Government has announced €1m in emergency funding towards the relief effort in the Philippines following the widespread destruction and loss of life caused by Typhoon Haiyan. Tánaiste and Minister for Foreign Affairs Eamon Gilmore said the funding would go towards shelter, food, water and health. 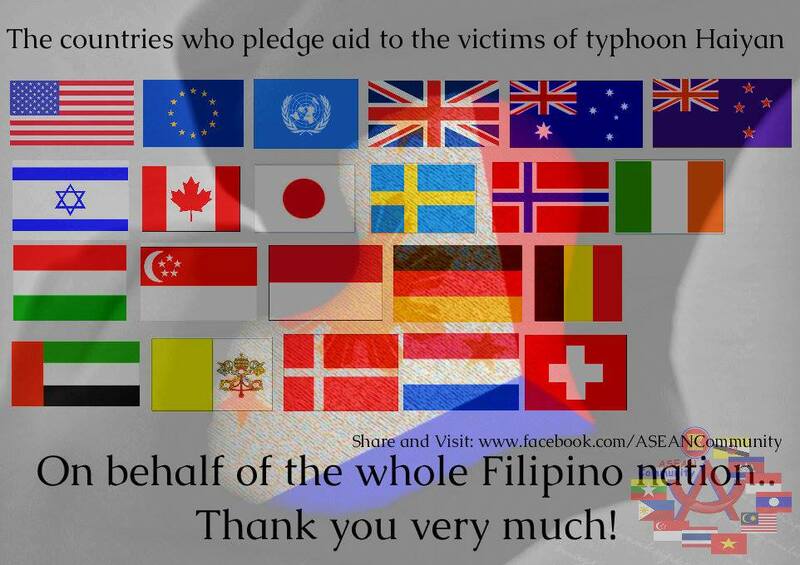 Thank You for helping the Yolanda victims. Surely, you will be rewarded for your kindness. There is still much to do. Rescue efforts are not enough. Plus there are still human searches being conducted as we speak. A friend of mine lost his mother in Tacloban because of this calamity. It’s tragic.